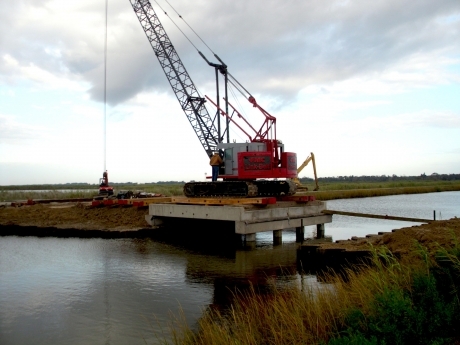 Inland Water Construction - Offshore Inland Services | Newpark Resources Inc.
Newpark Mats & Integrated Services not only specializes in providing superior construction services for land based operations, but also can provide our customers with construction services in inland water environments. These environments can be semi-solid environments, off-shore environments, marshland or coastal waterways, Newpark has the resources, personnel and equipment to successfully complete any inland water project. Our equipment and resources include, but are not limited to access to tugs, spud barges, deck barges, diesel hammers, vibratory hammers, heavy equipment and other related equipment to perform all of your marine tasks. 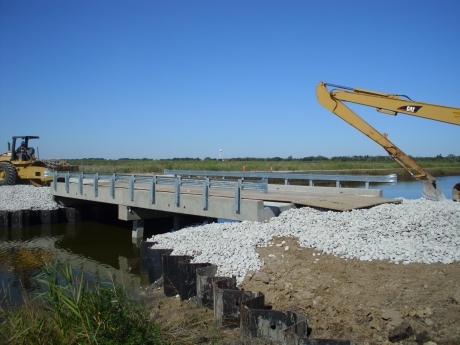 From construction and repairing bulkheads, to driving sheet piling, to constructing elevated concrete platforms, Newpark can provide you with safe, professional and efficient inland water construction services in any environment.